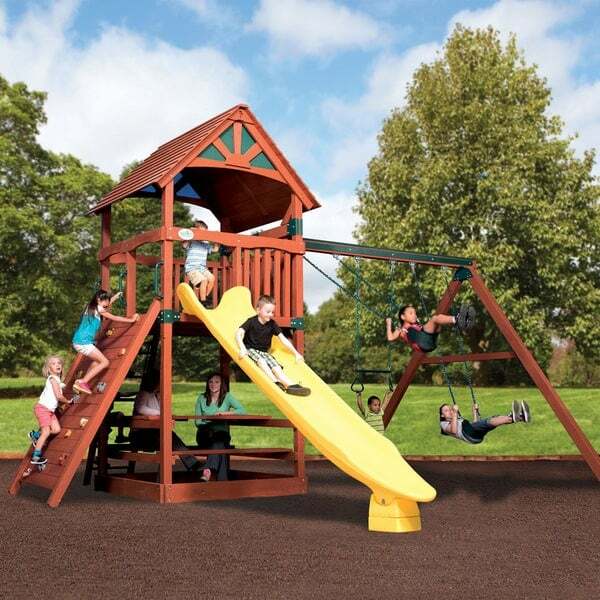 The Best Backyard Play Gyms & Swing Sets from Family Leisure! Backyard Adventures Treehouse Series is their most popular line of play sets and has been designed for you and your kids to have some play time together. That’s right! Why should they have all the fun? The Olympian Treehouse 4 is available with higher decks, higher swings and longer slides. It has been designed with the best in engineering and materials, and is supported by Backyard Adventures Limited Life-Time Warranty. Non-toxic, certified cedar lumber construction makes for strength and durability, and is naturally resistant to bug infestation, rot and decay. Exclusive compression clamps, floor joists and steel swing supports offer incredibly strong construction elements. Make an investment in your children’s health and wellness with the Olympian Treehouse 4 by Backyard Adventures.